Come and tour our campus on one of the dates listed below. You can meet our administrators, students, teachers and coaches, as well as gain a deeper understanding of the Benedictine community. Schedule a day to shadow a current student. Call our Admissions office at 216.421.2080 ext. 356 or Click here to become a Bengal for the Day! Call our Admissions office at 216.421.2080 ext. 356 or log into your Admissions Portal to register for an exam. Exam Fee: $20.00 which is payable by cash or check to Benedictine on the exam day. Complete the FACTS financial aid application. Access our FACTS financial aid application here. 2nd round deadline—May 1, 2019: In order to maximize your student aid award, application should be submitted by this date. Young men in a Catholic elementary school – Applications will be received from your schools during the first week of January. 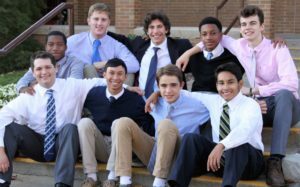 Young men in a public school – Click here to access online Application for Admission. We are here to help. Please call 216-421-2080 or email if you have any questions. Become a "Man Of Benedictine"
2900 Martin Luther King Jr. Dr.